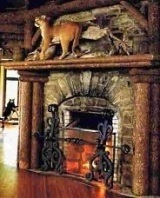 Standout River Rock Fireplaces . . . Cottage Cuties! The river rock fireplaces featured here are great for cottages of all sorts . . . . . from light and airy beach cottages, to Craftsman cottages with richly stained wood accents! The veritable masterpiece pictured at left is by master stone artisan, Lew French. Framed with driftwood, the area above the mantel shelf features an intricate arrangement of branches, twigs and stones. A romantic cottage garden with a stone arch bridge by Gallegos Corp. is a great precursor to the picturesque cottage hearths that follow! ed by small stones that have been carefully positioned and symmetrically arranged . . . . .
. . . . . while the following design is notable for its random placement of medium size stones -- both river stones and fieldstones -- in a variety of shapes and colors. The river stone hearths that follow present a study in contrasts. Below, left, is a rustic floor-to-ceiling design with randomly positioned stones in varying sizes and shapes. Conversely, the design pictured below, right, is crafted from uniformly sized stones that have been carefully positioned in horizontal rows, then capped with an elegant painted wood mantel shelf. nation of river rock and fieldstone. The designs that follow feature river rock and fieldstone surrounds in lovely shades of blue and blue-grey. True to form, the Craftsman inspired designs that follow feature attached and/or surrounding architectural elements of richly stained wood. A cozy inglenook enhances the inviting look and feel of the design pictured below, left. And finally, the fieldstone and river rock surrounds pictured at right and below expand the living area to the out-of-doors, while continuing to maintain a cottage look and feel!